← Human Kidney acquires a Woolly Mammoth Gene! Calgary: The world’s cleanest oil city. The list is long. Spindletop in Texas; Drake’s well in Pennsylvania; Petrolia, Ontario; Baku, Azerbaijan; Boryslav in Galicia. And many more. These are places spoiled by the boom and bust, rust and dust of oil production. I wonder if one day my hometown of Calgary will be listed among the burned out former glorious petroleum towns? Probably not, for reasons I’ll explore in a few moments. I’ve been reading an interesting blog piece from a site called Europe between East and West – an excellent effort that showcases central European history and culture to westerners. I am a westerner – born in North America – but my grandparents are from ‘over there’ so I read blogs about central Europe with a personal keenness. Last week, in a post called Black Gold in Galicia, the author gave a detailed story about one of the biggest forgotten oil booms in history. Galicia – a place that had princes and principalities – is now chopped up between Poland, Ukraine, and Slovakia. It was once called Austrian Galicia, though few Austrians cared to live in the provincial hinterlands ruled by Vienna’s Hapsburgs. Galicia seems almost completely lost to history now. So is its messy oil explosion, a boom that shattered the quiet Jewish village of Boryslav over a century ago. With the discovery of oil, the village became a city – its population grew 30 times in ten years. 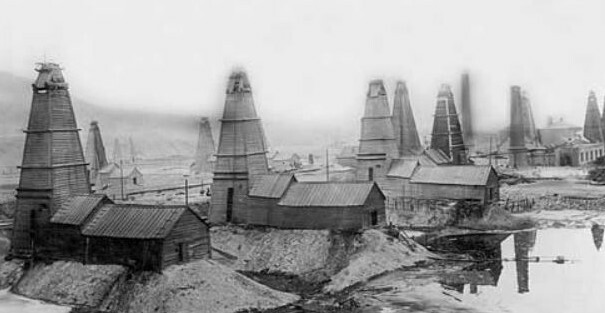 At its peak in 1908, 5% of the world’s oil came from the farmland surrounding Boryslav and the area was the world’s third largest crude producer. Today, a hundred years later, the city has little more than oil-smudged soil as a reminder of once glorious days. Boryslav at the peak of its oil days. Concurrent to Galicia’s oil boom and bust was the development of western Pennsylvania’s oil fields around Titusville in Crawford County. Europeans once compared the two places favourably. Although the Galician oil wells were drilled first and with better technology, Pennsylvania eventually caught up. The flash of oil from Crawford County built noisy cities along the Appalachian foothills, though the area is again rural and quiet. 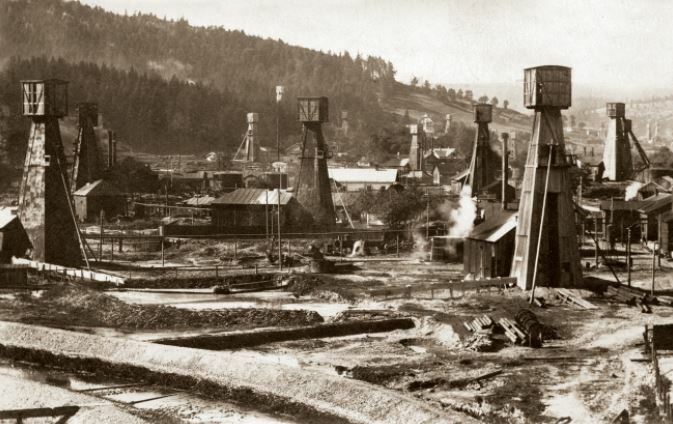 After 500 million barrels of oil were pumped from the Pennsylvania hills, the wells ran dry, the industry collapsed, and the wildcat drillers moved on. Some oilmen went to Texas where a stubborn engineer named Tony Lucas (Antun Lučić) drilled over a thousand feet to strike the world’s most famous gusher at Spindletop. When Lucas finally pierced the reservoir at the Gulf Coast salt dome, the overpressured petroleum reservoir blasted a million barrels of oil onto the bloated prairie field – deflating the dome and destroying the surrounding fields. Even today, a thousand-foot-wide splotch of grease marks the ground of the famous discovery. The well that helped power America’s amazing industrial boom is commemorated with a kitschy park and simulated boom town, built a couple of kilometres to the north in Beaumont. Tourists may delight in the plastic reconstruction of one of the country’s greatest moments, but for a more authentic glimpse of history, they need only cross the highway and venture to a dead end near Sulphur Drive to see the blackened field where industrialization really began. A similar tale can be told of Baku, Azerbaijan. Like Boryslav, there are still minor remnants of the foresaken oil industry in the form of aging Soviet-era refineries and factories. The earth beneath Baku once delivered hundreds of millions of barrels of oil. In 1901, half the world’s oil came from Baku and the shallow Caspian Sea immediately adjacent to the town. The fields were rapidly decompressed. Within twenty or thirty years, the party was largely over, though Azerbaijan continues to produce a million barrels of oil a year from fields in more distant parts of the country. The ugliness and environmental degradation of last century’s depleted oil fields give pause when you live in one of the world’s important oil cities, as I do. 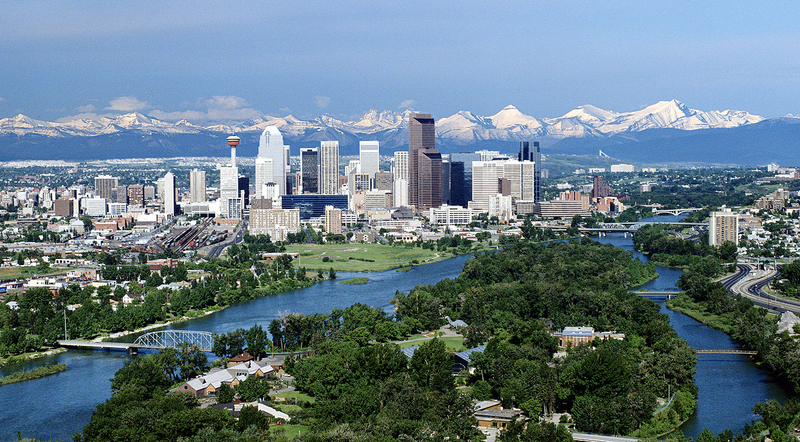 For three generations, Calgary has been the home office for several hundred oil and gas companies. Just a few dozen kilometres south of this city of a million, the western Canadian oil boom began in 1914. The area was called Hell’s Half Acre because of the flaring of natural gas from oil wells. Thousands of hellish wells were drilled within a few years. Geologists, wildcatters, and investors stayed in Calgary, about two hours away by automobile at that time. Calgary stayed clean while 10,000 oil wells were drilled each year during the 50s, 60s, and on up to this decade in reservoirs scattered throughout the province. Even the distant oil sands – the world’s 3rd largest oil deposit – is overseen from Calgary, though the city is 700 kilometres southwest of the digging and pumping. Calgary is unlikely to suffer the fate of Boryslav or Baku. Calgary regularly scores first in the world for clean air and water – according to the yearly analysis of Mercer Global which studies such things. (By the way, after Calgary in cleanliness are Adelaide (Australia), Honolulu, Minneapolis, and Kobe, Japan). No one foresees Calgary as a wrinkled and rusty collection of pipes and pumps. However, just as all the other oil boom towns of the past saw their fortunes fail as oil fields were depleted, Calgary may also suffer an economic downturn. Remaining provincial reserves are shrinking. Production costs are rising – it becomes progressively more expensive to recover oil when fields start to decline. The oil sands of northern Alberta may last a century or two, but producing oil from tar is expensive. Doing it right – with minimal environmental damage – is costly. So what might the future of the city be? I’m optimistic. It will find its way. 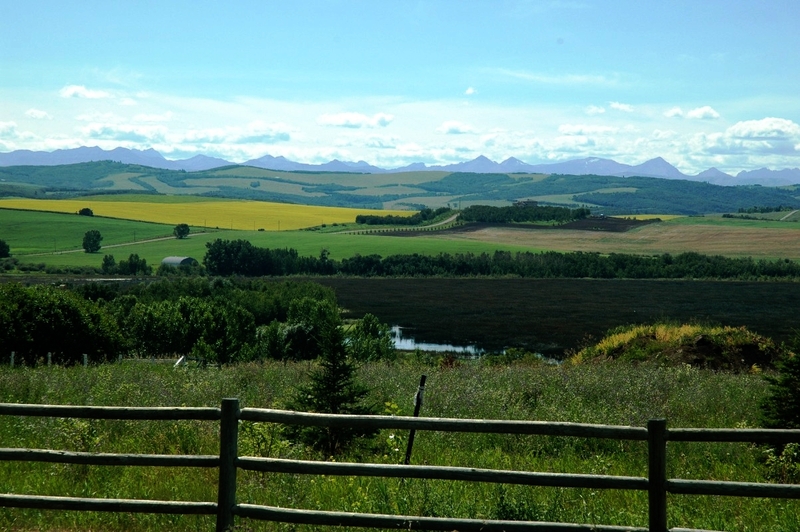 The southwest edge of Calgary, close to the place Canada’s big oil boom began a hundred years ago. This entry was posted in Environment, Exploration, History and tagged Alberta, Calgary, Galicia, oil industry, Spindletop, Titusville, Tony Lucas. Bookmark the permalink. A lot of what you see in these photos stems from the rather poor choice of laws that most nations had in developing their oil reserves (basically, there was incentive to split up parcels in leasing, and then once somebody drilled, there was incentive to drill on the edges of the lease to prevent neighbors from getting “your” oil). A rather thorough history of the legal side of this (with pieces of the history of the oil fields) is “Finders Keepers? 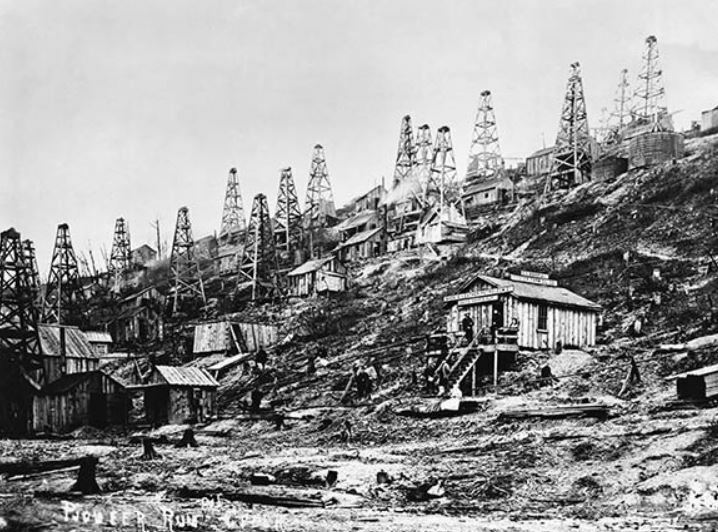 : How the Law of Capture Shaped the World Oil Industry” by Terence Daintith. Although at times the book descends into too-dense verbiage and legalese that becomes mind-numbing, the overall picture is amazing to see. The collapse of many of these oil fields is the direct result of this kind of development.